The 30th edition of the annual Cersaie show attracted a record number of international visitors to Bologna in late September. Some of those international attendees were four NTCA Five Star Contractors who traveled to Bologna to tour the Laminam plant and powwow with Crossville and Laminam personnel. These contractors gave jobsite perspectives on installation methods and approaches to the new Laminam by Crossville reduced-thickness/thin tile Crossville is importing exclusively into the U.S. (see related story in the January 2013 issue). One couldn’t be in Bologna and miss the show, so our four contractors – Dan Welch, Welch Tile, James Woelfel, Artcraft Granite Marble & Tile Co., and Martin Howard and Chris Walker, with David Allen Company (DAC) –toured Cersaie, as well. Contractors were thrilled with the opportunity to experience the international show, and to visit factories that produce innovative tile technology. “I love going to Cersaie because I love Italian food, wine, cheese, cars, the countryside and history!” said DAC’s Martin Howard. “Oh yes, and then there are the beautiful tile, colors and design options that can turn one’s mind loose with creativity. Mix and match: patchwork tiles and varying color, size and material in one collection. Ceramic fabric and textile-derived aesthetics: plaid, silk, lace, tweed, damask and more can all be evoked by today’s tiles. Installation made easy: new installation systems included clip systems for 2 cm thick porcelain tiles, quick-laying floors and monolithic porcelain slabs, thick 20mm tiles which offer an incredibly high breakage load (up to 2,000 pounds) and can be dry-laid on grass, gravel, dirt, and cement without grout or adhesives. Size matters: reduced-thickness/thin tiles and giant slabs are proliferating at an accelerated rate as acceptance of this new technology grows. Digital printing: ink-jet technology continues to expand the possibilities for surface decoration. Celebrity designers: artists, graphic designers and material architects are working with tile’s graphic potential and synergy with fixtures and accessories. The next Cersaie show in Bologna will be September 24-28, 2013. Visit www.cersaie.it/eng/ for more information about the show. 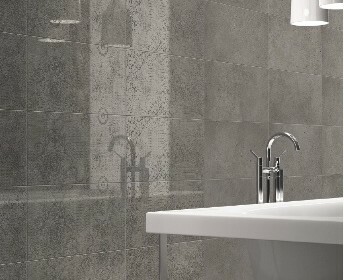 Archistone by Cerdisa displays a fabric look. Tagina offers five tile collections in 20mm/3/4” thicknesses, which can be dry-laid on grass, gravel, dirt and cement with or without adhesives. Cotto d’Estes adds Exedra to its super thin (3mm) and large (1mx3m) Kerlite series, with six types of marble looks and three finishes. 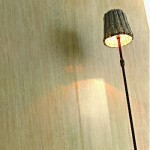 Root by Caesar features a hand-planed effect. 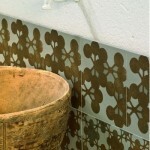 Azulej glazed porcelain tile collection is designed by Patricia Urquiola for Mutina, inspired by ancient handcrafted majolica made of hydraulic cement, in 8”x8 formats in nine patterns or as a combination of 27 different designs. PHILADELPHIA, Pa. – Regional tile distributor Garden State Tile (GST) will host the Laminam by Crossville Launch Event at its new, state-of-the-art Architectural & Design Center in Philadelphia in conjunction with the DesignPhiladelphia festival. The event will take place on Thursday, October 11th, with an open house from 5 – 8 p.m. and a presentation at 6 p.m. GST’s Architectural & Design Center is located at 2401 Walnut Street. The event is free and open to the public. Billed as “large format porcelain panels,” Laminam by Crossville products are just 3mm thick with outer dimensions of 1m x 3m. The lean profile combined with generously sized panels creates a versatile surface skin ideal for giving walls, doors, counters and cabinetry a nearly seamless appearance. Lightweight yet very durable, these porcelain panels expand the possibilities for tile applications for both commercial and residential use. 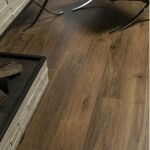 Garden State Tile is the exclusive source for Laminam by Crossville in the metro Philadelphia area. The Laminam by Crossville event is being held as part of the annual DesignPhiladelphia, a four-day festival celebrating the region’s design industries at work and the city’s contemporary significance as a center for creative innovation and advancement. For more details on Garden State Tile’s Laminam by Crossville Launch Event or any DesignPhiladelphia festival activities, visit events.designphiladelphia.org. Members of the media are invited to attend and may request interviews and showroom tours by contacting Irene Williams at [email protected]. 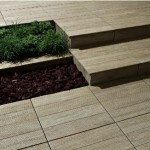 Garden State Tile (GST) is a tile distributor with 10 design centers located throughout the eastern U.S. The company is built on the idea that people make all the difference, and its service and design expertise has defined its reputation since GST first opened for business more than 50 years ago. Grounded in a long tradition of supplying the highest quality tile products and service, Garden State Tile offers guidance, education and consultation to its customers, including interior designers, architects, retailers and product specifiers for national accounts. In 2011, GST opened its 5,000 square foot, state-of-the-art Architectural & Design Center located at 2401 Walnut Street in Philadelphia, PA, giving a spatial showcasing of premium porcelain, stone, ceramic, glass tile and much more. For more details, visit gstile.com. Founded in 1986, Crossville Inc. is a U.S.-owned and operated manufacturer of award-winning tile collections for residential and contract applications. The company is the first U.S. tile manufacturer to achieve the following: – production of large format tile on site, – manufacturing tile with certified recycled content, – development of the Tile Take-Back® Program for recycling fired porcelain tile – certification of its waste recycling programs – TCNA’s Green Squared certification for all of its U.S.-produced tile lines, – become a net consumer of waste. Laminam by Crossville is Crossville, Inc.‘s exclusive U.S. distributorship of select thin panel porcelain products manufactured by Laminam S.p.A., the world leader in the production of large format, lean profile ceramic surfacing products. A consolidated division of Systems Group, Laminam S.p.A. utilizes an advanced, fully automated production process to create large and lean profile ceramic and porcelain slab products available worldwide.